A teaser for "Whole World Is Watching", the new video from Dutch symphonic rockers WITHIN TEMPTATION, can be seen below. The full clip will make its online debut next week. 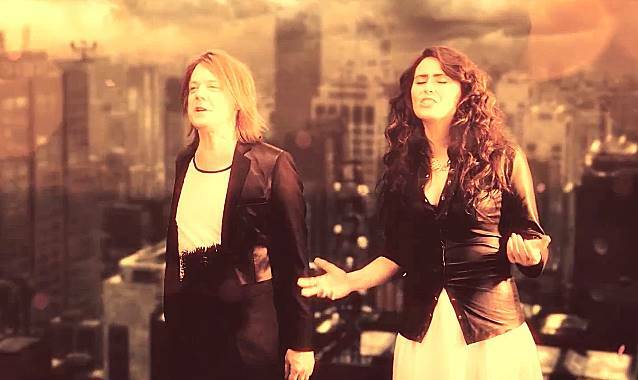 "Whole World Is Watching", the third single from WITHIN TEMPTATION's new album, "Hydra", features a guest appearance by SOUL ASYLUM frontman Dave Pirner. It is a power ballad about facing and conquering your fears. "When we wrote 'Whole World Is Watching', Dave was at the very top of our list," said WITHIN TEMPTATION singer Sharon Den Adel. "He has such a captivating voice: it made the song exactly how it needed to be." "Hydra" will be released on January 31. The album will be available in several luxury formats. The cover artwork was created by Romano Molenaar ("X-Men", "Batman", "The Unforgiving"). Pre-order "Hydra" via iTunes now, and you will instantly receive the first two singles: "Dangerous", featuring a guest appearance by former KILLSWITCH ENGAGE singer Howard Jones and "Paradise (What About Us?)" featuring ex-NIGHTWISH singer Tarja Turunen. The digital premium album, complete with digi-booklet, will be available on iTunes and includes 18 audio tracks and a music video. The digital premium album features bonus "Evolution Versions" of four new songs, which contain audio commentary from guitarist Robert Westerholt and Sharon and give you unique access to the development of the songs, their lyrical inspiration and the sound of the initial demos and vocals.